Vigils with drag artists and musicians, meticulously researched heritage listing applications, a tongue-in-cheek ‘funeral’ for much loved nightlife spot – these are some recent activist tactics employed to resist market-led redevelopment of LGBTQ+ spaces in London. In the 1980s, campaigning groups and social spaces proliferated alongside a growing LGBTQ+ rights movement. But are London’s queer spaces ­–whether bars, community centres, cabarets or cruising areas – now under threat? This display focuses on the rarely seen archives of LGBTQ+ venues and social networks collated by University College London’s Urban Laboratory, who also contribute an interactive map charting the appearance and disappearance of spaces over the last 30 years. 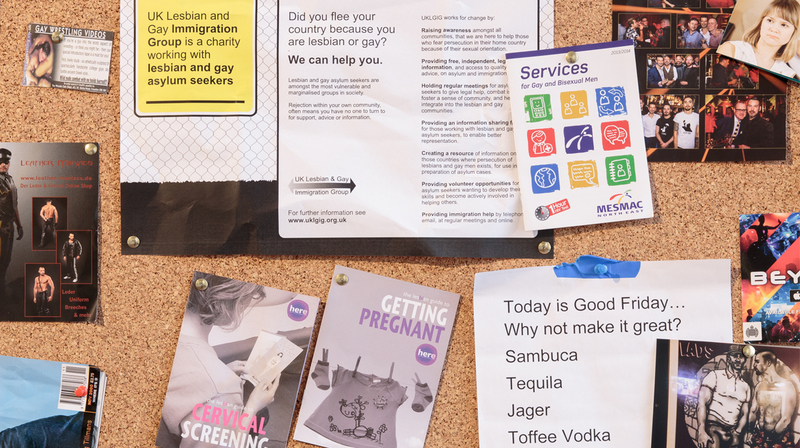 Among the featured case studies are the London Lesbian and Gay Centre and Black Lesbian and Gay Centre, both running in the 1980s and ‘90s; Glass Bar (1995–2008), a space in Euston for women, trans women and non-binary patrons; and venues such as The Joiners Arms, The Black Cap and The Royal Vauxhall Tavern that are the subject of current campaigns against redevelopment. Together, they reveal the radical inventiveness and creativity of London’s LGBTQ+ communities since the 1980s. The Whitechapel Gallery Archive Exhibitions are generously supported by Catherine Petitgas. A club night will be hosted in parallel with the exhibition in collaboration with Miranda at Ace Hotel London, who have made discounted rooms available for Whitechapel Gallery audiences.